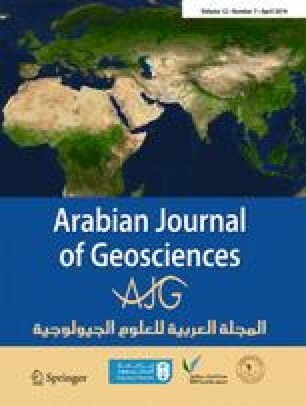 The spatial distributions of naturally occurring radionuclides (226Ra, 232Th, and 40K) in agricultural soils collected in the proximity of a coal-fired brick kiln located at Chittagong district were studied using HPGe γ-ray spectrometry. The obtained mean activity concentrations for 226Ra, 232Th, and 40K were slightly higher than the world average values, which indicate the contribution of radionuclides via the fly ash deposition from the kiln. The maximum activity concentrations of 226Ra, 232Th, and 40K in soil samples collected at a distance of 120 m from the kiln were found to be 54.3 ± 11.3 Bq kg−1, 62.1 ± 18.2 Bq kg−1, and 572 ± 123 Bq kg−1, respectively; the levels show further decreasing trend in all directions (towards and away from the kiln). Associated radiological hazard indices were calculated in order to assess the radiation effects to human health and compared with the world-recommended values. Basic multivariate statistical analysis was performed to describe the statistical characteristics of the radionuclides. Lower values of radiological indices indicate that there is no probability of immediate health effect on workers and public living around the kiln due to the presence of natural radioactivity in the agricultural soils. The author is grateful to the authority of Chittagong University of Engineering and Technology, Atomic Energy Centre Chittagong, Bangladesh Atomic Energy Commission (BAEC), and BGC Trust University Bangladesh for providing this research opportunity.